As the inventor of the very first wood pellet grill you can expect the best from Traeger. The Traeger Timberline Wi-Fi Controlled Wood Pellet Grill does not disappoint. You can easily keep your smoker at a consistent temperature thanks to the innovative design and WiFIRE. WiFIRE is a WiFi enabled controller that allows you to remotely adjust the temperature of your grill through your smart phone. The pill shaped barrel design and 3 adjustable tiers of stainless-steel cooking grates allows for even more smoking with the benefit of the added height and space. The double walled stainless-steel interior and airtight lid gasket keep outside air temperatures at bay and allow for consistent interior temperatures. Other great features of the Traeger Timberline wood pellet grill include a built-in meat probe, bamboo cutting board, all-terrain wheels, built-in meat probe storage, easy hopper clean out, and much more. If you want a smoky wood flavor to complement your food, a Traeger pellet grill is the way to go. You can easily switch between different Traeger hardwood pellets for the perfect blend of smoky flavor. For a sweeter smoke, try fruit flavored woods such as apple or cherry wood. For a savory flavor, choose bold woods like mesquite or hickory. For even more smoky flavor, use the Super Smoke Mode to bump up the smoke at the push of a button. WiFIRE technology allows you to use the Traeger app to control your grill from your smartphone. The WiFIRE controller lets you adjust smoke settings, set timers, or change temperatures from 165 degrees to 500 degrees Fahrenheit all via the Traeger app on your smart phone. You can also find great recipes and join the Traeger community to see what other grill masters are cooking on the mobile app. The Traeger Timberline smoker has a hopper capacity of 24lbs of pellets – 6 lbs more than the Pro series. More pellets means a hotter max temperature of 500 degrees Fahrenheit, which is 50 degrees hotter than the Pro Series. The grill grates on the Timberline series are made of stainless steel compared to the porcelain coated steel of the Pro Series. While the Pro series is not wi-fi capable, the Timberline’s WiFIRE capability allows the user to access the grill at any time, from anywhere. 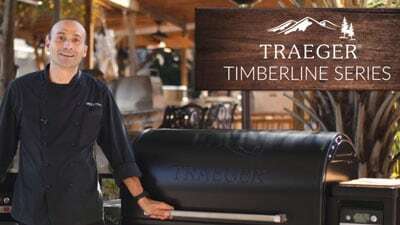 For more information on what sets the Traeger Timberline apart from the rest, check out our Traeger Grill Comparison Chart and compare the Traeger Timberline to other Traeger grills.